Who doesn’t enjoy saving money? On this page, you are going to learn how to save money on your InMotion Hosting business hosting order. How to claim the 50% off InMotion Hosting discount offer from TopFiveAdvisor. The differences between the three business hosting plans they offer. How to choose the right plan for your needs. A full walk-through of the ordering process. How to have InMotion Hosting automatically setup your WordPress during the ordering process. InMotion Hosting Review – This is our main featured InMotion Hosting review page where we go over the full plan offers, hosting features and more. GoDaddy Domains – This link will take you to the current GoDaddy discount offer for the cheapest domain name registration they offer. During the video, you’ll see me, Scott Buehler, make choices during the ordering process. Let’s take a moment to explain exactly why I made those decisions. I chose the Launch plan. For most customers, they will not likely need more than 2 hosted websites for their shared hosting account. Unless you have a reason to believe you’ll need more, you’ll save the most by choosing this plan. Of course, if you need to upgrade at a later time, all it takes is a quick support email and they will let you know what the fees are to upgrade and activate your upgrade, typically within an hour. I chose the 12 month prepay option. For most, you’ll want to save the most and spend the least to get your web hosting started. The cheapest plan and the cheapest payment is done by choosing the 12 month option. If you’d like to save more for a longer period of time, then feel free to choose the 24 month option. Your cost will be $83.88 instead of $47.94 by choosing the 24 month prepay option. I skipped ordering the domain through InMotion Hosting. If you attempt to order your domain through InMotion Hosting, you’ll pay $11.99 for the first year and $14.99 for each additional year. If you go through our link to GoDaddy, your first year with your new domain is just $1.49 at the time of this writing. Your renewals will be around $14.99 but you can search the Internet for renewal discounts to get that under $9 as well. I skipped “managed hosting” as this simply adds a lot of cost to your hosting plan ($49 for 2 hours of help) for something you won’t likely need. If you run into difficulty, you can submit a ticket to IMH and they will be very willing to help you. We wouldn’t recommend them if they required payments to get support. I skipped McAfee Anti-Virus. For most people, if you download an email to your computer that has a virus, their current antivirus solution on their computer will clean and remove it automatically. This is an unnecessary add-on. I chose the “Content Management System Auto-Installer option WordPress. This option will automatically install WordPress on your domain without any headaches. When you get your welcome email, you’ll have access to your WordPress installation immediately without anything required on your part other than checking that radio button during your order. Use this link to order your hosting. Send us an email with Purpose “General Comment” asking us for our WordPress training series. In your email, include the web host you went with and paste in your order confirmation email from IMH. 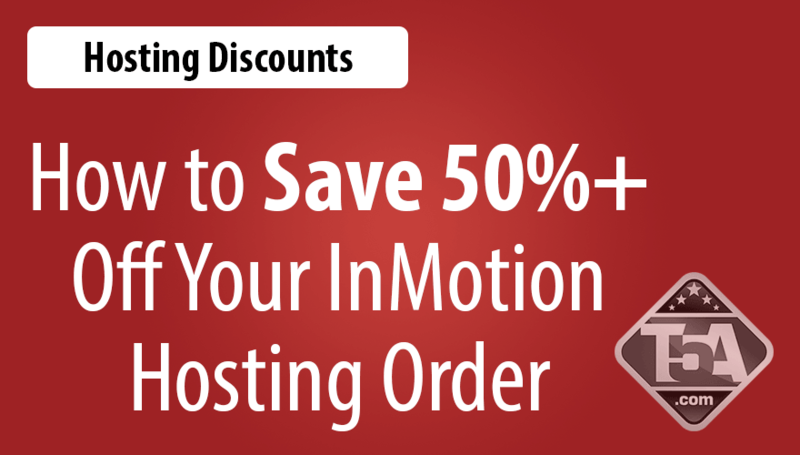 As always, if you have any questions about this InMotion Hosting discount or about our WordPress training, please feel free to comment below. If you don’t want us to publish your comment, let us know in the comment you write.